King: Does anyone wanna marry my son? Anastasia: This is the real Cinderella, your one true love. Prudence: Stop! You there who are you? What are you doing here? Prudence: I’m in charge of all the servants in this castle, and I have never seen you before. What is your purpose? Cinderella: My purpose…well uh I, I, I’m the royal mouse catcher! Prudence: Royal mouse catcher!? That’s preposterous! Cinderella: Snap ’em and trap ’em. That’s my motto. Stepmother: It's not over yet. Stepmother: He thinks he can ruin my plans I think not. Stepmother: The prince he's gone after Cinderella. Anastasia: But I thought he loved me. Stepmother: You spoiled little ingrate I've given you everything you've ever wanted Anastasia. Anastasia: But I want someone to love me for me. Cinderella: [facing a human version of Lucifer] Bad kitty. Jaq: We got to pump up the party. Stepmother: And now for you. Drizella: Oh turn her into a toad mother. Stepmother: Anastasia where you been? King: You think there's only one woman in the whole kingdom who wears a size four and half? Prince Charming: It's all I have to go on here. Anastasia: [having just turned fairy godmother to stone] Uh, oh! Hello, hello grandma?! Ooo! I’m, I’m sorry! I didn’t mean to hurt you! : [Takes wand from Anastasia] So this is how Cinderella did it. What delicious irony. Do you realize what this means, girls? Drizella YES! No more laundry. Lady Tremaine Ugh! It means power, riches, revenge! Anastasia: [while prancing around the room, laughing excitedly] Ah! It fits! Oh, Mother! Mother, it fits! Prince Charming: Will you marry me Cinderelly? Cinderella: Yes! But actually it’s Cinderella. Lady Tremaine: Anastasia, where have you been? Drizella: Oh! Let’s beat her with it! Prince Charming: Would my perfectly, perfect wife put her on perfectly fitting shoes? Cinderella: You found my shoes. Prince Charming: [playing keep away with the shoes] Better hurry. Fairy Godmother's waiting. Cinderella: What were the mice using them for this time? Prince Charming: [turns shoe upside down and water pours out] Boats. King: Keep in mind I'm an old man and my heart can only take so much. Please, please, please, tell me that this is the girl you intend to marry. Prince Charming: All the stars are shining brighter, Dad, just like you said. Prince Charming: You'll be fine just don't look up. Jaq: Now what are we going to do? Cinderella: Well I'm not going to miss my own wedding. Prince Charming: So your say I'm under a magic spell. Jaq: And here's the worse part. Jaq: When Cinderelly tried her best to take a stand. Jaq: Mean old lady had her banished from the land. Anastasia: [returning the King's seashell] Your majesty, I don't deserve this. King: Everybody deserves true love. Prince Charming: Well, once you've dance with someone like Anastasia, you dont' want to waste any time. Cinderella: Did you say Anastasia? Drizella: Lets make a run for it while we can. King: I trust you son, it's the talking mice I'm worried about! The King: Keep in mind I’m an old man and my heart can only take so much. Please, please, please [looks at Cinderella] tell me this is the girl you intend to marry. Prince Charming: [Staring at Cinderella] The stars are shinning brighter dad, just like you said. The King: [Jumps up] Then what are we waiting for! Fetch the flouriest, bake an even bigger cake, the wedding is on tonight! Prince Charming: [sees Anastasia] Oh, uh, am I in the right room? Of course I am in the right room. Um there seems to be a little mix up here. Lady Tremaine: I assure you your highness the slipper fits my daughter’s foot. Drizella: Ha! How could he miss it? Lady Tremaine: You look confused dear. Cinderella: How could the slipper have fit Anastasia? I danced with the prince that was my slipper! Here I have the other one. I’m the one he is looking for. Lady Tremaine: You may have danced with him. You may even have thought it was love! But the slipper fits Anastasia and that’s who he is marrying! Whatever you think happened last night was a dream. Prince Charming: Wait, wait, wait! I think I understand. Prince Charming: Actually I got nothing. Prince Charming: Ok. First birds, now mice. Stepmother: Now, Cinderella, to undo your trickery and take what's rightfully ours. I call upon all the forces of the universe. Bibbidi-bobbidi-boo! Reverse the moon and sun, turn back tide and time, unravel Cinderella's happily ever after to the moment my troubles began! 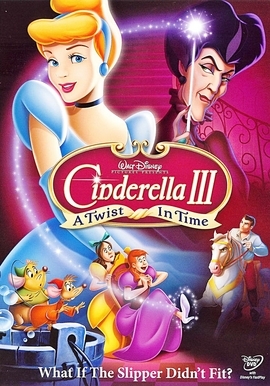 Cinderella: [singing] I've always dreamed, that my life could be like a fairy tale, a perfect fantasy. But it was nothing more than a dream. Cinderella: But... it was me. King: Son! Come back! We'll find you a doctor! We'll have you leeched! Stepmother: [pointing the wand at Cinderella] Bibbidi Bobbidi Boo.